The Maika Waxed Mustard Canvas Carryall Tote is the roomiest utility tote yet. With 3 interior pockets, a waterproof lining, and a strap that hooks any Maika pouch, going out never was so simple and chic. 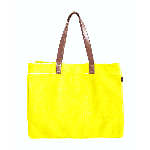 The Maika Waxed Mustard Canvas Carryall Tote is made from recycled canvas and hand printed with eco-friendly pigment inks. It features a waxed layer that helps protect against dirt and stains, making it a great bag to take to the beach, class, or to the gym. Dimensions: 18" x 14" x 6"